KOTLI: Police arrested a man for making a bomb threat to Geo News. 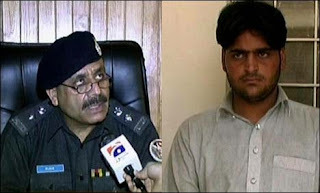 According to the police, Yasir, 20, a resident of Qamroti village of Kotli in Azad Kashmir, had made a telephone call to Geo News office, saying that he would blow up the TV’s office with a bomb. The Bomb Disposal Squad had cleared the office following a search that lasted for several hours. The police traced the accused with the help of intelligence personnel and lodged an FIR against him under Telegraph Act. Yasir told police that he had called the Geo News office and said that a blast would took place at the TV’s building within 30 minutes.